Growing construction industry on account of strengthening commercial, hospitality and residential sectors in recent years has fueled the demand for construction equipment rental market in UAE. Furthermore, growth in construction sector is expected to come from infrastructure spending for World Expo 2020, which would ultimately boost the construction equipment rental market. Additionally, cranes and earthmoving equipment are likely to dominate the market as these equipment are majorly used at construction sites for excavation and lifting heavy weights. In UAE, Dubai accounted for the largest revenue share in the UAE construction equipment rental market share followed by Abu Dhabi and other Emirates. Further, construction projects across the commercial and residential verticals coupled with growing hospitality sector would be the key driving factors behind the growth of UAE construction equipment rental market. Some of the key players in UAE construction equipment rental market are Al Faris, Al Bahar, Johnson Arabia, Byrne equipment rental and Al Mutawa equipment rental. The UAE construction equipment rental market report thoroughly covers the UAE Construction Equipment Rental market by equipment type, applications and regions. 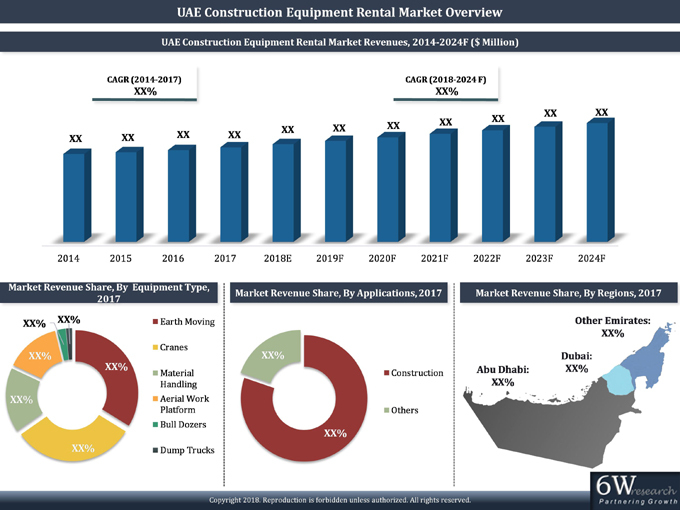 The UAE construction equipment rental market outlook report provides an unbiased and detailed analysis of the UAE construction equipment rental market trends, opportunities, high growth areas and market drivers which would help the stakeholders to device and align their market strategies according to the current and future market dynamics. • Historical data of Global Construction Equipment Rental Market Revenues for the Period 2014-2017. • Market Size & Forecast of Global Construction Equipment Rental Market Revenues until 2024. • Historic data of UAE Construction Equipment Rental Market Revenues for the Period 2014-2017. Forecast of Revenues, until 2024. • Historic data of UAE Crane Rental Market Revenues, By Types, By Lifting Capacity for the Period 2014-2017. • Market Size & Forecast of UAE Cranes rental Market Revenues, By Types, By Lifting Capacity until 2024. • Historic data of Bulldozer Market Revenues, By Operating Weight for the Period 2014-2017. • Market Size & Forecast of Bulldozer Market Revenues, By Operating Weight until 2024. By Operating Weight for the Period 2014-2017. By Operating Weight until 2024. Capacity for the Period 2014-2017. • Historic data of Dump Truck Rental Market Revenues, By Operating Weight for the Period 2014-2017. • Market Size & Forecast of Dump Truck Rental Market Revenues, By Operating Weight until 2024. • Market Size & Forecast of Aerial Work Platform Rental Market Revenues, By Types, By Platform Height until 2024. • Historical data of UAE Construction Equipment Rental Market Revenues, By Applications for the Period 2014-2017. • Market Size & Forecast of Construction Equipment Rental Market Revenues, By Applications until 2024. • Historical data of Construction Equipment Rental Market Revenues, By Regions for the Period 2014-2017. • Market Size & Forecast of Construction Equipment Rental Market Revenues, By Regions until 2024. • UAE Construction Equipment Rental Market Trends and Developments. • UAE Construction Equipment Rental Market Overview on Competitive Landscape.